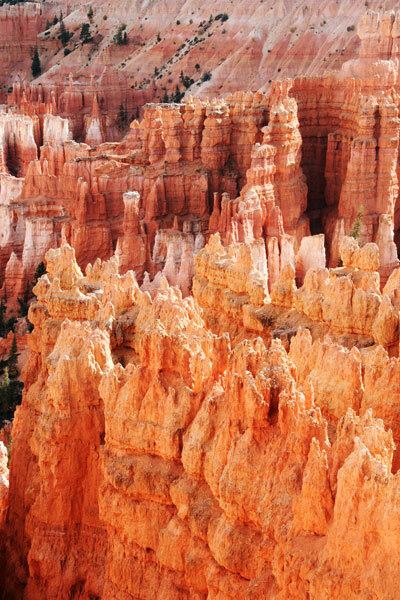 Bryce Canyon lies in south-west Utah and has a 100 million year history. Erosion of the sedimentary layers of sandstone, mudstone and limestone has created a myriad of fantastical pinnacles, each of them contributing their unique forms and colour to the visual harmony of the whole area. Native Americans lived in the area for several thousand years. Tourist appeared in the early 1900s and National Park status was granted in 1928. 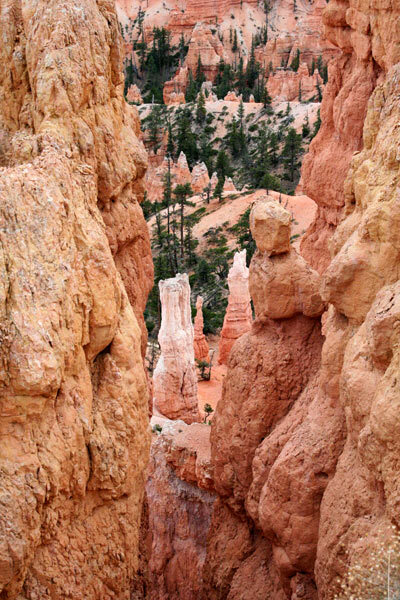 Bryce is an amphitheatre rather than a deep and narrow slot like the Grand Canyon in Arizona and the Black Canyon of the Gunnison in Colorado. 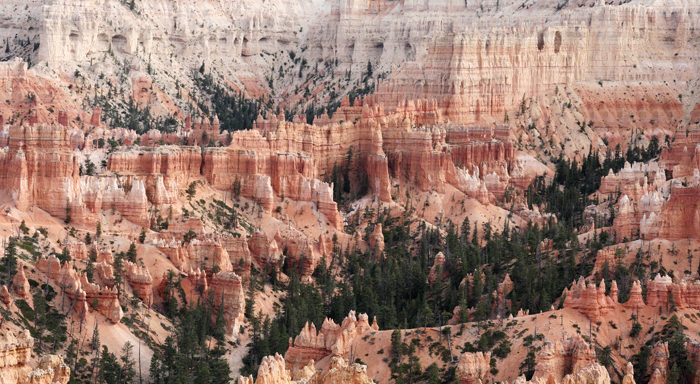 Bryce geology is complex and its erosion constantly evolving. Water cuts into the relatively soft strata and carries the debris down streams and larger water flows towards the Paria River. 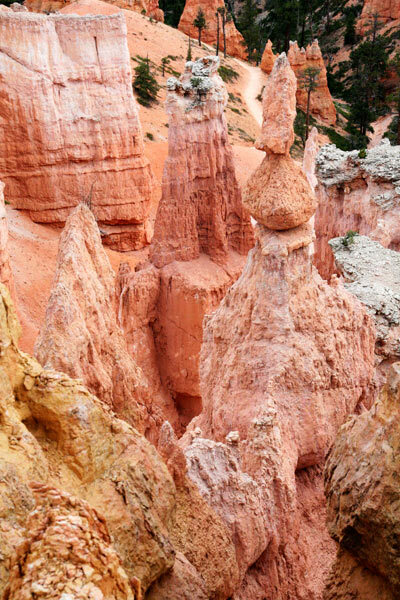 The photographs show fins cut by water and eroded further to create the spires and pinnacles popularly known as hoodoos. 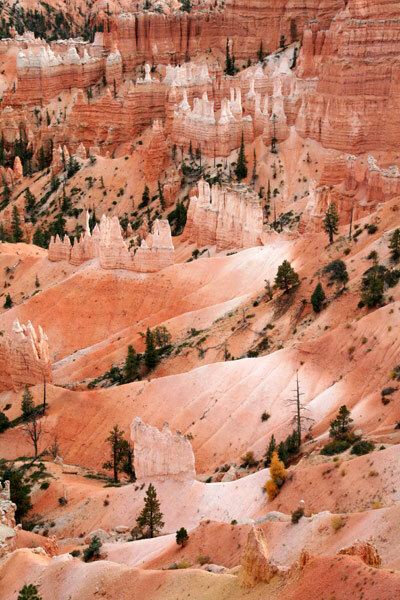 The Bryce Canyon National Park Information Guide presents a comprehensive account of the geological materials and forces that combine to create such a labyrinth of forms, something of its history and its range of habitats that support a rich diversity of flora and fauna. 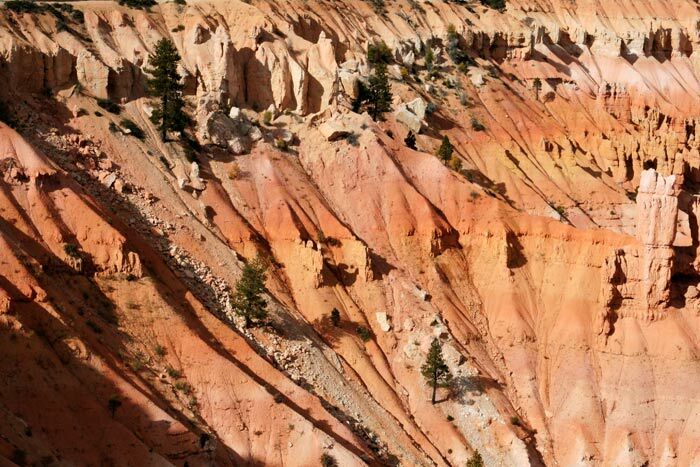 The open meadows and conifer forests on the canyon rim suddenly open out on to a vast sunken panorama in salmon, orange and white punctuated by seasonal colours of trees, shrubs and smaller vegetation. 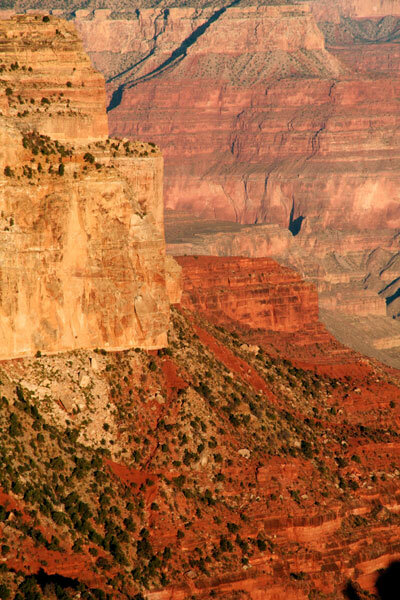 Most visitors view from the edge but there are pathways that zig-zag down the slopes below. There are some 400 plant species in the park, ranging from ponderosa pine and aspen to ground hugging plants such as the blue gentian. Others include aspen, sagebrush, blue columbine, gillia, bellflowers, yarrow and manzanita, each occupying their own niche in the six to nine thousand feet elevation of the Park. 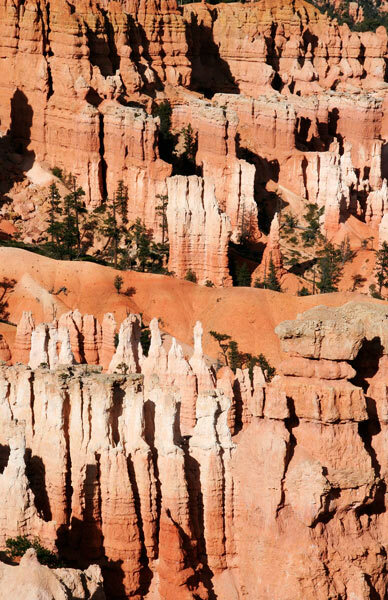 Over one hundred and sixty bird species inhabit Bryce; some are summer visitors such as the swallow and mountain bluebird whilst others such as ravens, peregrine falcons and golden eagles are permanent residents. Over fifty animals be have been recorded, with deer and elk in the wood and grass lands more easily observed than the rarer black bear and elusive mountain lion. Smaller ones include the grey fox, coyote, Utah prairie dog and ground squirrel. Sightings of some are more likely early and late in the day when the human visitors are few and unobtrusive. 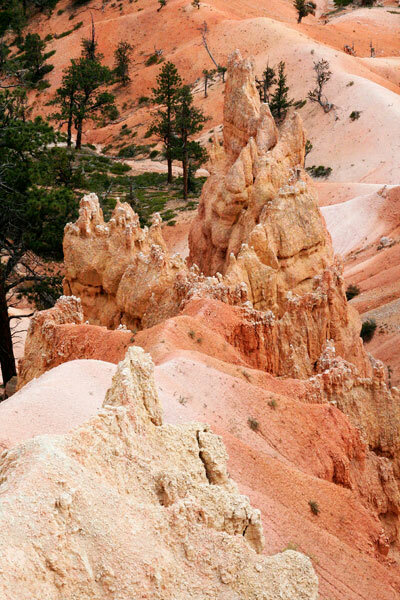 Bryce Canyon is quite close to Zion Canyon that offers a very different environment to the visitor. 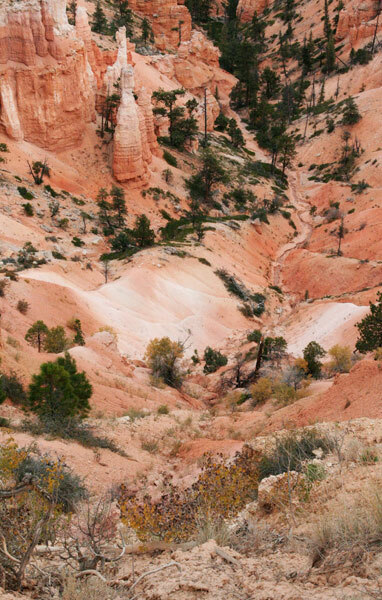 Trails lie below high cliffs of red sandstone so characteristic of this part of Utah. Visually very different, it is fascinating to explore both on successive days. 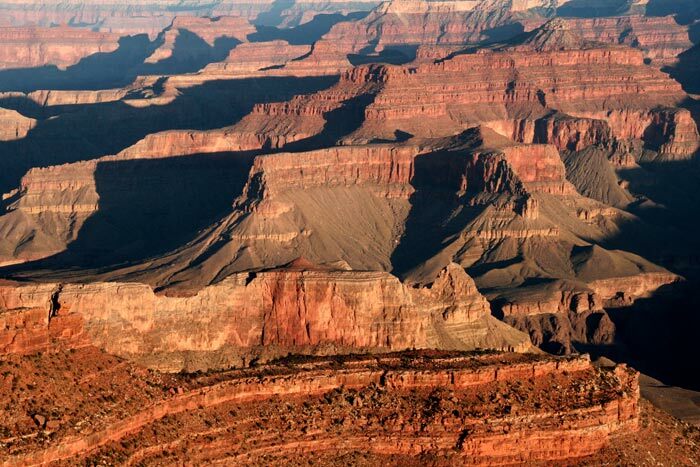 Familiarity with the Grand Canyon through photograph and film does nothing to diminish the visual and emotional impact of emerging from the tree cover on the flat rim landscape to confront the immensity of the Canyon. Some 175 miles in length, it's one mile deep and up to 18 miles wide. 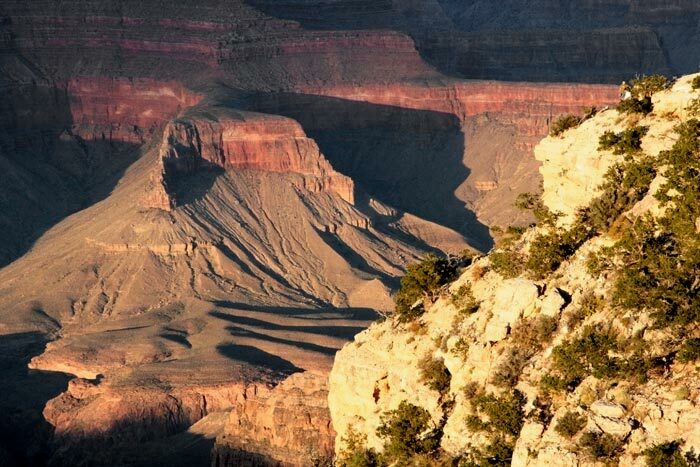 Most visitors walk the south rim east and west from Grand Canyon Village. 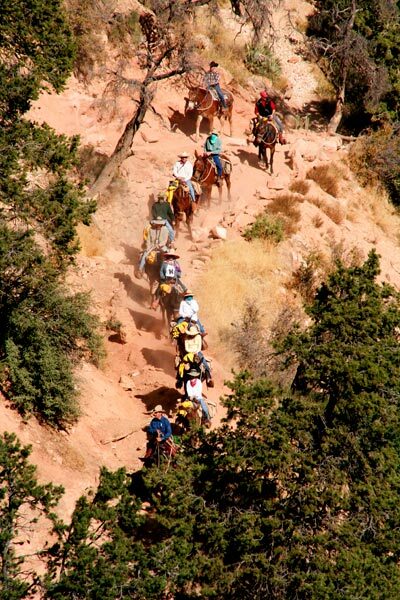 The more dedicated walk eight miles down the Bright Angel Trail to Phantom Ranch on the Colorado River with a vertical descent of 5000 feet. Mule trains offer an alternative mode of travel. 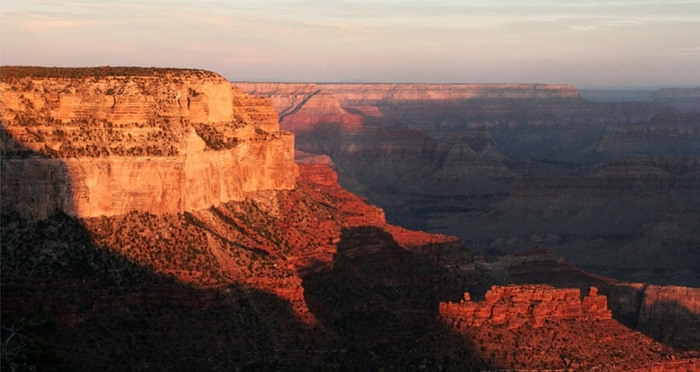 The North Kaibab Trail descends the 6000 feet from the North Rim to the river and, combined with the Bright Angel or South Kaibab trails, offers twenty walking miles to Grand Canyon Village on the South Rim over a couple of days. The northern descent is the steeper of the two. There are some fifty assorted trails in the Park. 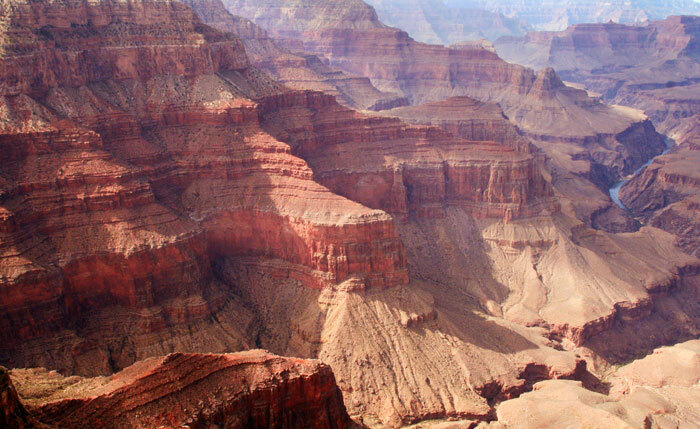 John Wesley Powell lead a boating expedition through the canyon between May and August 1869 and this must remain the best vantage point for geology, flora and fauna, native American relics and by far the most exhilarating. Crewed, motor powered, inflatable rafts are popular but intrepid purists might prefer the much closer water contact of a small oared dory with an expert boatman. 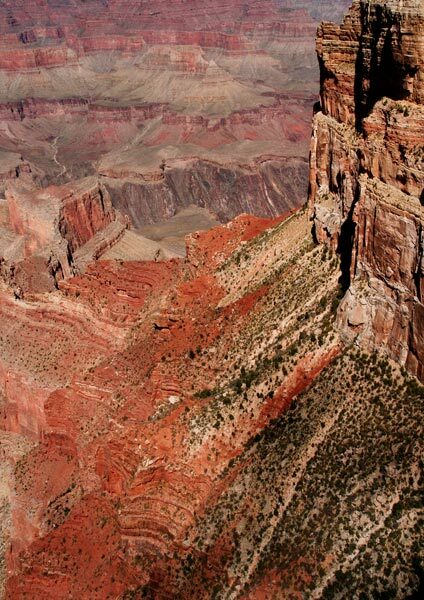 The North Rim is some 1000 feet higher than the South and is generally wetter, with snow in the winter. The vertical drop of 6000 feet to the Colorado River creates a range of climate zones equivalent to transit from the Canadian border to Mexico. Winter rim temperatures can drop to zero Fahrenheit (-17.8C) whilst summer riverbank heat can reach 100F (37.8C). 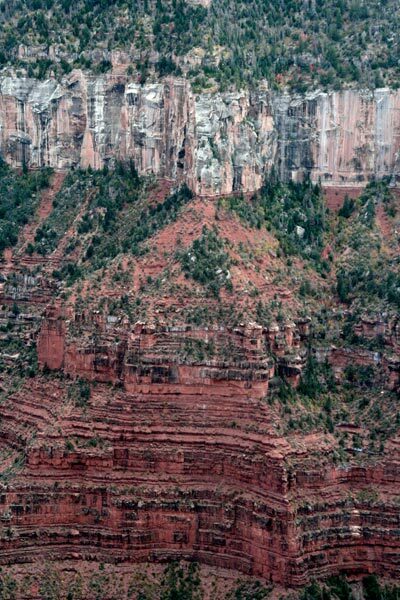 Annual rainfall is roughly 27 inches on the North Rim, 15 on the South Rim and around 8 at Phantom Ranch on the river. From ponderosa pine to rock hugging lichen, there are over 2000 species of plants within the park, each finding its own ideal habitat. Park and Canyon wildlife includes bighorn sheep, mountain lion, beaver, chipmunk, western red bat, bald eagle, raven, yellow warbler, western bluebird, banded gila monster, Hopi rattlesnake, tiger salamander, brown trout, red shiner, swallowtail butterfly and scorpion being just a few. A very early morning walk offers complete or near solitude to watch dawn and sunrise. Moving as quietly as possible on woodland paths or sitting still and silent by the rim can enable wildlife sightings impossible later in the day; mule deer are the most likely large mammal to appear. 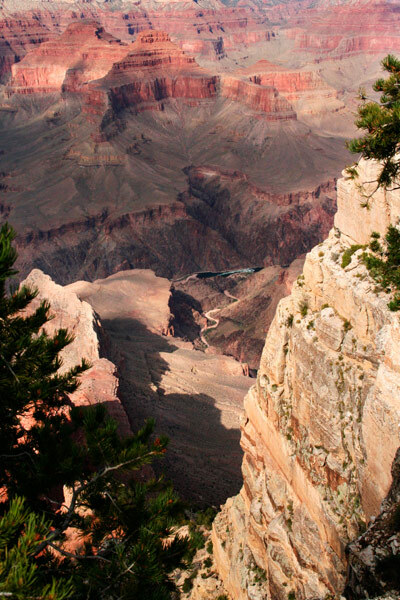 Most of photographs were taken from the South Rim but this one from trails starting at Grand Canyon Lodge on the North Rim. The light was low, shadows were deep, there was atmospheric haze and time was short so walking took precedence over photography.